Don't give up hope on grabbing a hearty breakfast in the daily scramble to get ready for work or school. 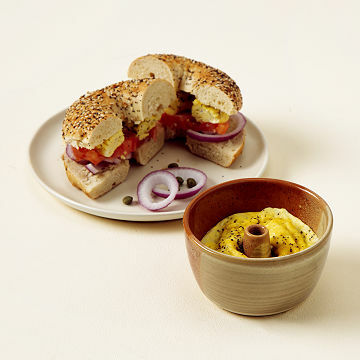 This handmade ceramic dish from Maggy Ames lets you cook up a fresh bagel sandwich in seconds. Simply whisk some eggs into the dishtoss in some veggies for an instant omelet, or stick with egg whites for a low-cholesterol dietand pop it into the microwave for 60 seconds. In short order, your eggs are cooked into the perfect shape and size to layer onto a sliced bagel. Yum. Now grab it and get going before you're late! Handmade in New York. 2.5" H x 4.5" Dia. This bagel egg maker is amazing! The size is perfect for my morning bagel thin. It gets a little hot in the microwave but nothing a towel or pot holder won't fix. Since bagels are one of my sister's favorite breakfast foods, this was the perfect gift for her. She used it right when it arrived and she was extremely satisfied with her egg! I don't cook but I have relatives you do. This is ideal! I like how deep it is. You can use one or two eggs at a time. Clean up is super easy. Great gift for a student who makes everything is the microwave. What a great handmade gift! Who isn't a sucker for a tasty egg bagel sandwich? I will buy this again for my 2 other sons for college. My son mixes everything inside the vessel so it easy, fast when your trying to get to classes.